Chris Kelty, Andrew Lakoff, Martin Hoyem, and I wrote a short article on Limn for the European Association for the Study of Science and Technology Review. The Preface to Limn 9, Little Development Devices, Humanitarian Goods–which I wrote with Jamie Cross, Peter Redfield, and Alice Street–is now available online. 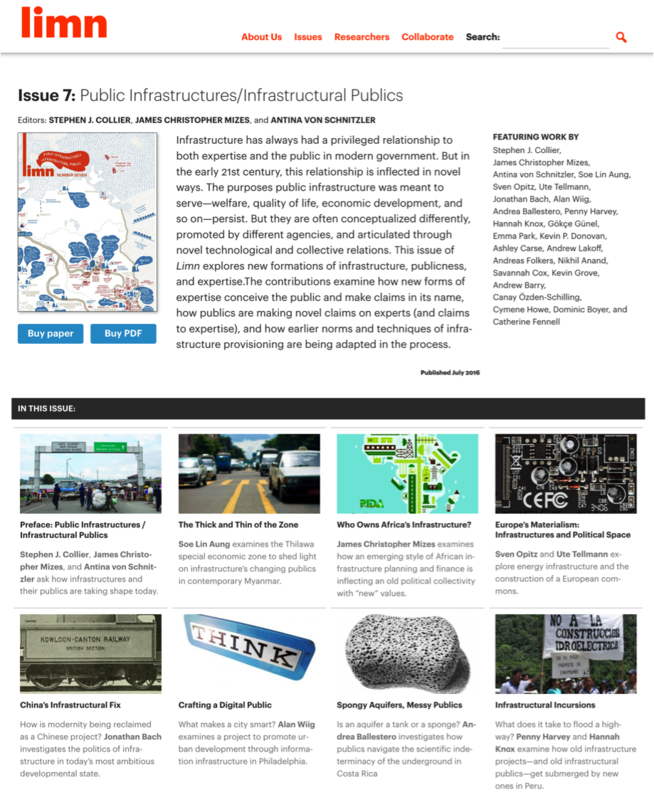 You can see our preface and the entire issue, as well as much of our next issue, on Chokepoints, on our redesigned website. Among the new features is that you can now pay what you like for PDFs of the print version of the issues (which are also available, as before, in print-on-demand format). A prize! The Society for the Social Studies of Science awarded its annual David Edge Prize for an outstanding article in STS to my article with Andrew Lakoff, “Vital Systems Security: Reflexive Biopolitics and the Government of Emergency,” published in Theory, Culture & Society. “Vital Systems Security: Reflexive Biopolitics and the Government of Emergency,” from Theory, Culture & Society, vol. 32, no. 2 (2015), pp. 19-51. 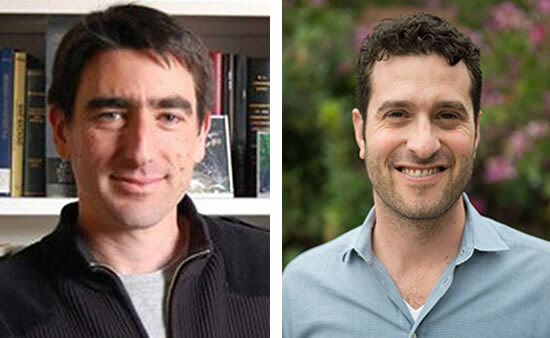 The Edge Prize Committee is pleased to present the award to Stephen J. Collier and Andrew Lakoff for their article, “Vital Systems Security: Reflexive Biopolitics and the Government of Emergency,” from Theory, Culture & Society, vol. 32, no. 2 (2015), pp. 19-51. In a piece that seamlessly weaves deep theoretical engagement with rich historical analysis, Collier and Lakoff complicate our understanding of biopolitics as an organizing logic of modernist governance. They demonstrate that the techniques of population management that emerged in the 19th century, such as public health and urban planning, and which have formed the basis of social scientists’ theories of biopolitics, represent but one approach taken by states to securing the health and well-being of their national populations. Alongside these techniques of “population security,” Collier and Lakoff argue, the 20th century witnessed the emergence of “vital systems security,” which takes as its object the distributed, sociotechnical systems on which human populations have come to depend and aims at assessing and avoiding unpredictable, episodic threats to these vital infrastructures. By demonstrating the distinctiveness of vital systems security and its significance in contemporary governance, Collierand Lakoff do more than extend theories of biopolitics–though that in itself would make a significant contribution to the field. They also engage theories of the risk society, showing how the techniques of vital systems security address potentially catastrophic events that exceed traditional forms of risk management. In addition, while adopting a rigorously neutral stance, the authors open up new possibilities for assessing techniques of contemporary governance, especially in times of disaster acute and chronic. Arguing that the notion of the “state of exception” has been overgeneralized, thereby obfuscating whole realms of expertise and governance, they ask us as researchers to consider instead the ways vital systems security thinking shapes how states exercise power in their normal, and normalized, management of emergencies. Collier and Lakoff’s paper was selected from among 22 nominees from the journals East Asian Science, Technology and Society: An International Journal, Asian Medicine, Configurations, Social Studies of Science, Science, Technology, & Human Values, Theory, Culture & Society, Kronos: Southern African Histories, Bulletin of the History of Medicine, Journal of the Royal Anthropological Institute, Cities, and Engineering Studies. In evaluating this field of high-quality papers, the committee looked for work that combined empirical data with a clear theoretical framework in a way that reached beyond the boundaries of a particular case to advance thinking in STS. Awarded annually for an outstanding article in the area of science and technology studies. The Prize is named in memory of David Edge (1932-2003). David was trained in astronomy, and worked with the BBC before becoming the first Director of the Science Studies Unit at the University of Edinburgh in 1966. He had a strong administrative and intellectual role in the development of science and technology studies, as we know it today. He was active with the 4S from its beginning, and served as President and received the Bernal award for lifetime achievement. Throughout his life, David lent his tremendous energy to a broad range of interests and activities. Especially pertinent for this award was his role as co-founder and long-term editor of Social Studies of Science (1970-2002). He was no ordinary editor: his unparalleled enthusiasm and unique personal touch pervaded even the most routine aspects of editing, and his encouragement and diligent work with new authors helped launch many careers in the field. We are honored to accept this year’s David Edge Prize, and grateful to the prize committee for its perceptive and careful reading of our article. It is especially gratifying for our work to be recognized within the field of Science and Technology Studies, which has been a site of continuing inspiration and lively engagement for us. Our article was the product of a lengthy process of collaborative research and writing, and we are grateful to a number of colleagues who provided feedback and encouragement along the way. In particular, we would like to thank the editors of the special issue of the journal Theory, Culture and Society in which the article appeared: Pete Adey, Ben Anderson, and Stephen Graham. We are also grateful to the Science, Technology and Society program of the National Science Foundation for its support of our ongoing research on contemporary forms of security. Andy Lakoff and I published a short piece in The New Republic that recalls how some of the architects of the modern American state created mechanisms of executive power that, they hoped, would make crisis government compatible with democracy. The upshot, not surprisingly, is that President Donald Trump has been using these very mechanisms to undermine American constitutional order rather than to preserve it.